The price of oil has risen in response to the turmoil in Libya. Brent crude had jumped 2.6% by late afternoon to $105.2 a barrel, its highest level since before the 2008 financial crisis. European energy companies are evacuating some staff from the country, which is a major oil and gas producer for the European market. Meanwhile shares in Italian oil firm ENI - which is active in Libya - ended Monday trading 5.1% lower. 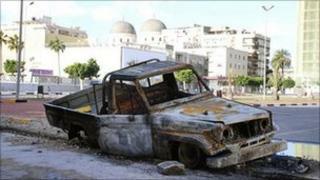 The Italian company said on Monday that its operations were unaffected by the violence. Italy buys about one-third of Libya's oil and gas exports, making it the country's biggest customer by far. ENI has been buying gas from Libya for decades, and is at the centre of a close political relationship between the two countries, according to one analyst. In 2008-09, the Libyan government had considered buying an up-to-10% stake in ENI, although the investment did not go ahead. Some 13% of the company's revenues come from Libya, and 30% from North Africa as a whole, meaning the firm is highly exposed to instability in the region. Although market concern about the firm is focusing on the short-term impact of the unrest, the analyst said there were also fears that a change in regime could lead to the Libyan assets of ENI and other foreign investors being expropriated. The Italian firm said it was bringing home its employees' families and non-essential personnel, and was "further reinforcing the security measures for its people and plants". ENI is not the only foreign oil company affected by events in Libya. Shares in Austria's OMV - another European firm that has been active in Libya for many years - ended the day down 4.2%. OMV, along with Royal Dutch Shell, BP, France's Total and Norway's Statoil, have all said they are repatriating some or all of their non-local staff. Both BP and Shell are only involved in exploratory preparatory drilling in the country, and neither is currently producing oil there. BP said it had suspended its onshore operations. The European Union is preparing to evacuate its citizens from the country. The UK Foreign Office has already advised that those without a pressing need to remain in the country, should leave by commercial means if it is safe to do so, as has the US. Meanwhile Turkey has already begun flying its 3,000 or so citizens in the country home. Commodities markets are worried about more than just Libya, with the threat of unrest escalating in Iran - the second biggest oil producer in the Organisation of Petroleum Exporting Countries (Opec). There is nervousness that even Opec's biggest producer, Saudi Arabia, may yet succumb to instability, although the autocratic regime there has yet to witness any protests. Oil supplies in Libya and elsewhere have yet to be significantly disrupted by any of the events in the Middle East. However, the head of the Al-Suwayya tribe in eastern Libya is reported to have said they will attempt to stop oil exports to Europe if oppression of protesters by the Gaddafi regime continues. Strikes by workers have already shut down the Nafoora oilfield, which is operated by a subsidiary of the Libyan state-owned oil company, and protests have also closed the Ras Lanuf oil refinery, according to local news sources. "I think markets are more twitchy than they normally would be, mainly because there isn't a huge amount of over-capacity in the market and therefore any interruption to supply from a major producer could see prices spike considerably higher," said Nick McGregor, oil analyst at Redmayne Bentley. Opec is thought to have an additional 4.7 million barrels-per-day available, compared with Libya's exports estimated at 1.5 million. Libya is responsible for only 2% of all oil production worldwide, although its share of the European market is estimated at 10%. Oil production is essential to the Libyan economy, with oil output accounting for 95% of export receipts and 25% of the country's economic output.